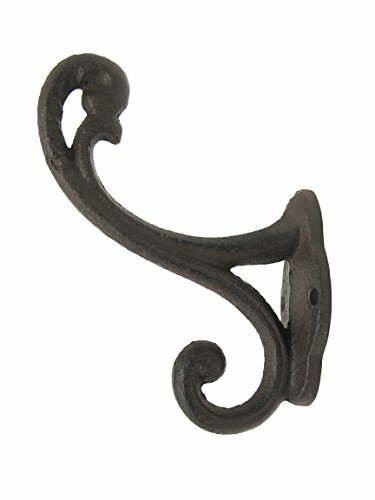 Size:Large | Color:Rustic Set of 6 Rustic Cast Iron hooks, Vintage & Shabby Chic Inspired, Perfect for hanging Coats, Bags, Hats, Towels, Scarf's and more by Ashes to Beauty Perfect for indoors or out, in your entryway or mudroom to hold coats, bags, hats, scarves, towels, brooms, dog leashes, keys chains, horse harnesses, boots, tools, etc. or use in your charming home, farmhouse kitchen or home, to hold hand towels, aprons, pot holders, utensils and more. Features: Heavy, Sturdy, Cast Iron Classic Style, Authentically Reproduced Measurements: H 4.5 x W 1.5 x D 3 inches Pre-drilled holes for easy mounting (SCREWS INCLUDED) Satisfaction Guaranteed. We're in the business of making customers happy! ORDER NOW Keep in mind that this item was manufactured to look antique, expect some built in imperfections, which adds to its rustic charm. Please Note: As stated above, mounting hardware IS included. Vintage / Shabby Chic Inspired, Rustic Brown Design Scroll ,This Item was made to look antique, expect some built in imperfections, which adds to its rustic charm and beauty. Classic Style, Authentically Reproduced Farmhouse/Schoolhouse Style. If you have any questions about this product by Ashes to Beauty, contact us by completing and submitting the form below. If you are looking for a specif part number, please include it with your message. Antique Silver Countertop Earring Stand, 18 1/4"